StarQuest Singing Competition Returns; With more than one way to enter the competition!! 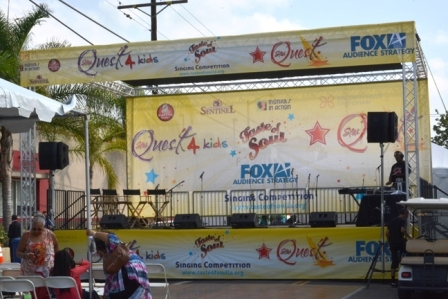 StarQuest will celebrate five years at the 11th annual Taste of Soul (TOS) Festival on Oct. 15 as the premiere South Los Angeles singing competition. For the past four years, adults and kids have earned a spotlight thanks to their talents. And for the first time ever, StarQuest will give local talent the opportunity to enter the competition in more ways than one! StarQuest will hold in-person auditions on Saturday and Sunday, September 24 & 25th at the Baldwin Hills Crenshaw Mall. The adult auditions (ages 18 and up) will take place on Saturday, September 24 from 10am-5pm. The kids auditions (ages 5-17) will take place on Sunday, September 25 from 1pm-5pm. All new this year, StarQuest will have online and mobile submissions to win a finalist spot in the StarQuest Adults Singing Competition (18+ yrs) and a spot in the StarQuest Kids Singing Competition (5-17 yrs)! It all started in 2012 where StarQuest debuted at TOS created for the community by the Los Angeles Sentinel and Bakewell Media. The first StarQuest resulted in 12 semi-finalists, who performed on the StarQuest stage during the festival were Beau Williams and Adrian Battle won the competition. In 2013, StarQuest welcomed a kid’s competition, which featured youth ages 5-17 in addition to the adult competition. Nathan Davis, Jr. and Noah Jay won the adult and kid’s competition in 2013 respectively. In 2014, Mothership was the winner of the adult competition and Tim Jr. won the kids competition. StarQuest winners gain the opportunity to build and expand their brand as well as appear at multiple venues and in media. As a result, many of the winners have been put on a path towards success as a result of the competition. StarQuest has had the honor and pleasure in having some of the best judge the competition including executive producer, Tony Cornelius, son of the legendary Don Cornelius creator of “Soul Train,” Yvette Bailey (former “Soul Train” producer), talent executive and Rayva Harrell (Nickelodeon’s “All That,” “The Steve Harvey Morning Show”). TOS continues to miss and honor the memory of Harrell, who passed away in 2015. Her contributions to StarQuest and the entertainment industry stand as a precedence. During TOS, StarQuest has welcomed a host of five-star talent and celebrities as judges, which included Michelle Williams, Deitrick Haddon, Tamala Jones, Angie Stone, Rickey Minor, Willie Norwood, Howard Hewett and Darrin Henson. Other notable judges include Peter Wise, Judge Mablean, Hosea Chanchez, Sandy Christmas and David Lombard. For more information go to, www.TasteOfSoulLA.org or www.lasentinel.net. Follow Taste of Soul on Facebook and Twitter @tasteofsoulla.